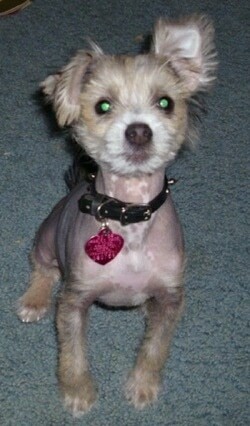 "Onyx is a Chinese Crested / Mini Schnauzer, shown here as a 4-month-old puppy! I got him from a breeder out of Iowa. 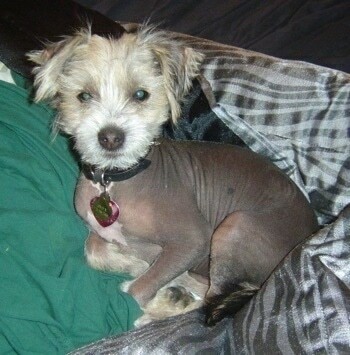 Onyx is the only one from his litter with the Schnauzer coat, but he is hairless. Onyx has a full head and crest socks, and tail. He will get a little hair down his back (very sparse) that I will shave. He also has the Schnauzer ears, which are floppy. We frequent the dog park to interact with his fellow dogs at least 3 times a week, but being 5 pounds right now he has to stay with the little dogs, even though we feel we should run with the Great Danes. Onyx gets along with big dogs great. (We play with a Retriever, Boxer, Greyhound and Shepherd daily) but smaller dogs he is not too great with. Onyx seems to be more fearful of smaller dogs than bigger ones." The Crested Schnauzer is not a purebred dog. 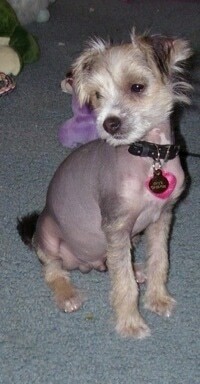 It is a cross between the Chinese Crested and the Miniature Schnauzer. The best way to determine the temperament of a mixed breed is to look up all breeds in the cross and know you can get any combination of any of the characteristics found in either breed. Not all of these designer hybrid dogs being bred are 50% purebred to 50% purebred. It is very common for breeders to breed multi-generation crosses.